This is a momentous time in the history of this country. I hope that one and all realise their good future in living to witness and to play their part in these momentous days. If you will take the trouble to look up the "Forewords" that I have written for the Magazine in former years, you will see that I have urged again and again the need for those who pass through Queen's to prepare themselves as efficiently as they can for the day when their service to the country will begin to have definite constructive value. And it have urged that this preparation consists not only in academic progress, essential though this be, but also in progress in other activities: Games, the Cadet Corps, the Scouts, the various Societies all play their part in building up the personality that is needed to make the "men of stature" than an independent Guiana will need for its well-being and prosperity. We are happy and proud to record that our first Premier, Cheddi Bharat Jagan, is an old boy of this school, and we take this opportunity of congratulating hirn on achieving this great honour. And now that our Premier has been chosen, it must be clear to. all that it is essential that he should be supported and encouraged in his difficult task of leading Guiana to independence and prosperity, not because he is the leader of the Peoples' Progressive Party, but because he is the Premier of Guiana, and he is therefore our leader, whether we voted for him, or supported his party, or not. Let there be no mistake; the future prosperity of the country will depend not only on the Pramier and his cabinet, but to an even greater extent upon the support that he gets from those who voted both for and against him in the election. This is democracy: now that Dr. Jagan has won, he becomes the leader of the whole country and we must all support him, or the progress will be obstructed and prosperity jeopardized. There is so much of the development programme that is agreed by all of us that it is bordering on lunacy to allow racial friction or any other pre-election or post-election propaganda to become an obstruction to the progress that we all desire. Recently, it has been noticed that the problem of disunity has enshrouded British Guiana. The situation has even approached the limit where racial antagonisms have come to the forefront; and has even attained the heights of absurdity in that the idea of separatism on racial lines has been injected into the minds of various sections of the community. In all fairness to the propagators of this idea it must be said that, though they themselves are philanthropic in their aspirations, yet, dividing British Guiana into zones is impracticable; and, as such, can occasion more harm than good. For some years now, many political and social balms have been prescribed for this infectious disease of "disunitis" History and Culture Week" and "The British Guiana Festival" are only two very clear examples of attempts, in the social field, to weld this country into some sort of entity with a common thread through the many races. Theoretically, a Guianese history and Guianese culture are desirable, and themselves purport to give a stimulus or even a basis for supposing that we shall be eventually united as a people. However, a somewhat false conception of this unity has been formed by quite a number of persons. They believe that such events, as the previously I mentioned "Festival", are capable o'f developing n purely Guianese culture. They believe that the gyrations and leaps, in this particular case, are obviously ebullitions of what will constitute a Guianese culture and inevitably, a Gnianesc nation. They are disillusioned. The word "NATION" implies that this country would have one race — not East Indians or Africans or Chinese — with a common culture, language and history. It also implies that we would be distinctly different from Spaniards, Italians or Englishmen. What, however, is totally undesirable, is that this word means that we would have to adopt that spirit of Nationalism. I am not prepared to voice any opinions as to whether or not such, a spirit has ever proven to be a force for the good; but I am prepared to say that, in this modern twentieth-century world, in this era when our emphasis is placed upon internationalism and global co-operation, the dogmatic national selfishness, which this force has so created in the past, seems to be entirely incompatible with my idea of domestic and external harmony. We can never be a race; and the acquirement of an unmistakenly Guianese culture seems very much in the future. A culture, although! the term itself is vague, cannot be created or written in the sense that a constitution can be. It is something which develops silently, imperceptibly at first, and gradually shapes its own course. The stress, therefore, is on "It cannot be created; least of all, by such artificial means." But it appears as though, in our attempts to achieve some degree of unity in this country, we are straying off the path and being lost. These various organisations are consequently only extracting synthetic elements from the community (they call this Guianese culture) and are themselves creating a synthesis in their approach to constructing a truly united people. Lately, innumerable aspersions have been cast upon the League of Coloured People, upon the continuance of certain Hindu and Moslem ceremonies, upon the ("xistence of a Chinese Association and upon the many representational forms of the races in British Guiana. These attacks are only justified when they refer to racial policies (if any) which can affect the community as a whole. Otherwise, as a solution for our major problem and as an alternative to our false idea of a Guianese Nation, it is undoubtedly a fact that a society with many, colourful, intrinsically different and beautiful cultural entities ought to have a tremendous attraction. This means that each race must preserve its racial identity, its cultural identity, its traditions and folk-lore to some extent; but it also means that each race would have to pool these possessions into a "Commonwealth." This "Commonwealth" must be our conception of a united, racially-unprejudiced Guiana.Perhaps, what we all need to develop immediately is no'f a nationalistic outlook but patriotic sentiments. BOODHOO, V. R. (1953—61)—Coronation Scholar 1953; 1958—'O' Level; 1959 Senior School Scholarship; L/cpl. 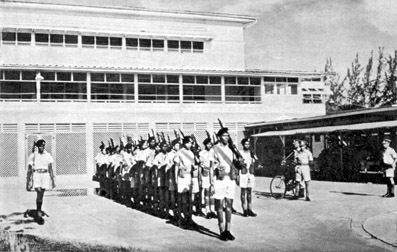 Cadet Corps; 1960 Sgt. Cadet Corps; School Prefect; Head of Nobbs House—Advanced Level. BUTCHEY, J. R. K. (1954—61)—1954 Govt. County Scholarship; 1959—G.C.E. Ordinary Level; Secretary of Co-operative Society; 1959—Haly Cup for Cricket; Assistant Editor of Lictor; Sports Editor of Magazine; 1960—Secretary of School Cricket; School Colours for Cricket; School Prefect; Head of Weston House— Advanced Level. CROAL, J. P.O. (1958—61.) School Certificate Scholar; 59—G.C.E. '0' Level; 1960— Advanced Level Pure and Applied Maths, (distinction); Editor of the Magazine; Vice-President of Debating Society; Member of victorious Patrick Dargan Debating team in 59; 60—School Prefect. Deputy Head of Raleigh House. CHAN, N. P. (1954—61)—1954 Govt. County Scholarship, 1959— G.C.E.—0' Level; Queen's College Senior Scholarship; School Colours—Football, 1960 School Prefect; Head of Woolley House; Nicholson Cup for Football-—School Colours—Hockey— Advanced Level. EDWARDS, T. C. (1953—61). 1953—Coronation Scholar. 1955—Junior Table Tennis champion, 1956—School Table Tennis team; L/cpl. Cadet Corps; School Captain Table Tennis—1959—G.C.E. W— Level; Senior Table Tennis champion, School Colours Table Tennis; Cpl. Cadet Corpse—Features Editor Magazine and Lictor— School 1st XI Cricked—School Prefect—I960—Head of Moulder House—C.S.M. ; Cadet Corps—Deputy Head of School. GRANT, R. E. (1953—61) 1956—Middle School Exhibition, 1958—School Debating Society—1959—G.C.E. W Level; School Football team—L/cpl. Cadet Corps—1960; School Prefect—Athletic colours—Sgt. Cadet Corps—1960—61—Viee-President: Q. C. Tour Club—Head of Austin House—Secretary Q.C. Athletic Club. HOPE, C. H. (1953—61)—1959—Committee member Literary and Debating Society— Vice-Captain Athletics—'0' Level; 1960—Acting Prefect; Athletics Colours; 1960— 61—School Prefect; Secretary of Q. C. Tour Club; Sports Editor of 'Lictor;' Captain Athletics team; Victor Ludorum. JACKSON, N. E. (1953—61) 1953—Govt. County Scholarship; 1957—59, '0' Level;: 1958—Secretary of Literary and Debating Society; 1960—Troop Leader Q. C, Scouts; Secretary Science Society; 1961—Deputy Head of Woolley House; 'A', Level. LEE, J. H. (1953—61). 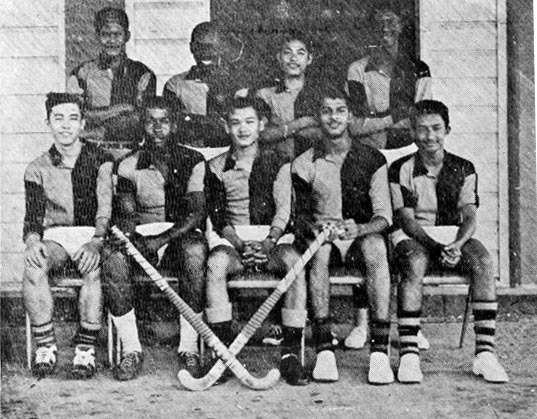 1960—0' Level; Hockey Captain 1961—Hockey Colours; Member of Colony's XI to tour Trinidad; '0' Level. LUCK, R. E. (1954—61). 1954—Govt. County Scholarship; 1959—'0' Level; L.R.S.M. Diploma; 1960—G.C.E. 'A' Level; School Prefect; Deputy Head of Austin House; L.T.C.L. Diploma; School Colours in Music; 1961—G.C.E. 'A' Level, F.T.C.L. Diploma. RAMPRASHAD, G. F. (1950—61); 1958—Secretary of Hockey; G.C.E. 'O' Level; 1959—G.C.E. 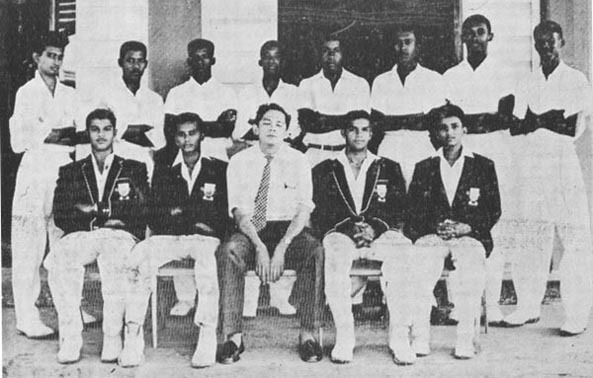 '0' Level; Secretary of Athletics; Vice-Captain of Hockey; School Prefect; School Colours in Cricket and Hockey; Acting Head of Pilgrim House; 1960—Captain of Hockey; Vice-Captain of Cricket; Head of Pilgrim House; Acting Head of School; Head of School. RAMPRASHAD, J. R. G. (1951—61); 1958—Haly Cup for Cricket; G.C.E. 'O' Level; Football Colours; 1960—Football Captain; Vice-Captain Cricket; Cricket Colours; School Prefect; Acting Head of Pilgrim House; Secretary of Literary and Debating Society; 1961—G.C.E. 'A' Level. RAMSAHOYE, W. A. (1953—1961); 1953—Colonial Life Scholar; 1958—G.C.E. 'O' Level; Percival Exhibition; Q.C. Scouts; Q.C. Cadet Corps; 1958-59—Treasurer Q.C. Lictor; Assistant Editor Q.C. Magiazine; 1960—President Q.C. Tour Club; School Prefect; Deputy Head of Percival House; G.C.E. 'A' Level (3 distinctions); 1960—Guiana Scholar. 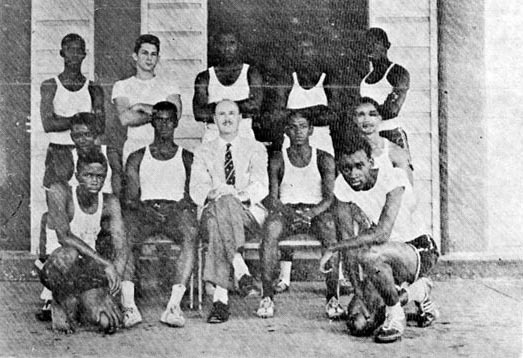 British Guiana Open Scholarship; 1961—School Colours. ROHLEHR, D. F. G. (1953—1961); 1953—Govt. County Scholarship; 1958—G.C.E. '0' Level; 1959—School Prefect; 1961—G.C.E. 'A' Level; Head of D'Urban House; 1958—Vice-president Literary and Debating Society; Vice-president Historical Society; 1961—Captain Wight Cup Cricket team; School Colours; U.C.W.I. Open Scholarship. 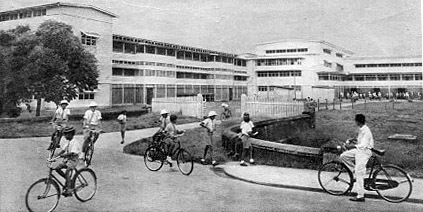 SPENCE, D. R. (1953—61); 1956—Queen's College Middle School Exhibition; 1958— G.C.E. '0' Level; Vice-president Historical Society; 1959—G.C.E. '0' Level; Business Manager Q.C. Magazine; Vice-President Literary and Debating Society; 1960— School Prefect; Head of Percival House; Assistant Editor Q. C. Magazine Treasurer Science Society; G.C.E. 'A' Level; 1961—G.C.E. 'A' Level; Demba Scholarship to U.C.W.I. STANDING (L to R):R.M. Janki, P.E. McLean, L.F. Fraser, H.E. Dolphin, A.M. Stuart, R.M. Stephen, A.R. Morrison, P.A.M. Griffith . SITTING (L to R):G.F. Ramprashad, R. Roopnaraine (Capt. ), Mr. B.A. AEyre, JR.G. Ramprashad (Vice Capt. ), J.R.K.Butchey . Algernon, M. 0. P .
Batson L. M. St. C.
Farnum, G. 0. Fields, C. A.
Nasir, Z. D. M. M. A.
Ng-Qui-Sang, 0. E. Noel, K.R. Hon. Dr. C.B. JAGAN (1932-35), on being elected 1st premier of a Self-Governing Guiana. Mr. L.F.S. BURNHAM, B.A. LLB, (1935-42), on being elected a Member of the Legislative Assembly. Mr. J. CARTER (1931-38), B.A. LLB., on being elected a Member of the Legislative Assembly. Mr. L.E. MANN, B.A., on being appointed Parliamentary Secretary in tenew Government. Hon Dr. C.J. JACOBS (1929-36), on being appointed Minister of Finance in the new Government. Mr. F.W.E. CASE, M.A. on being appointed Director of Education. Mr J. A. LUCKHOO (1931-36), on being appointed Chief Justice ot B.G. Mr. R. E. JACKSON, B.A., on being awarded the Post Graduate Certificate of Education after a year's study at Leicester University. Mr. M. T. LOWE (1942-49), B.Sc., on being awarded a scholarship to Bristol University. Mr. M. de V. DELPH (1933-43), M.A., on being awarded a Fullbright travelling Scholarship to the U.S.
Mr. K. A. L. BROWN (1936-43), M.A. , on his appointment as Principal of Anna Regina Secondary School. Mr. J. R. RAMSAMMY, B.Sc., on his appointment as Principal of Tajore Memorial Hiffh School, Corentyne. Mr. R. A. LEE, M.Sc., on being awarded a Research Scholarship to the University of Albertha, Canada. Mr. S. DABYDEEN, on obtaining his B.A. 1st Class Hons. (Lond.) in History at U.C.W.I. Mr. F. M. BIRBALSINGH (1945-56), on obtaining his B.A., 2nd Class Hons. (Lond) in English at U.C.W.I. Mr. W. W. ANDERSEN (1942-49), on obtaining his B.A. 2nd Class Hons. (Lond) in History at U.C.W.I. Mr. N. M. SUE-HO (1949-57), on obtaining his B.Sc., 2nd Class Genenal (Lond) in Chemistry, Botany and Zoology at U.C.W.I. Mr. N. W. LAYNE (1950-57), on obtaining his B.A. 2nd Class Hons (Lond.) in History at U.C.W.I. Mr. A. E. WHARTON, on obtaining his B.Sc., Special in Physics. Messrs. KUEHNEL, SINGH, ROHLEHR, CAMPBELL, CROAL, INASI, WILSON NIAMATALLI, PRASHAD and SEWCHAND, on being awarded scholarships to the U.C.W.I. .... and to all those who were successful at the annual external examinations. Special congratulations to : E. A. C. THOMAS and W. A. RAMSAHOYE, on being awarded the 1960 Guiana Scholarships. STANDING (L. to R.):P.A.M. Griffith, L. Bunbury, B.L. Dummett, R.L.A. Codette, F. Douglas. SITTING (L. to R.): C.O. Marshall, C.H. Hope (Capt. ), Mr. E.P. Clayton, R.E. Grant, E.I.J. Fields. KNEELING - D.A. Morrison, A.E. Fox. ABSENT: E.P.S Byrne, J. E. McTurk, C.B. Adams.